An excerpt from the December 22, 1973, memorandum of conversation that was initially redacted. 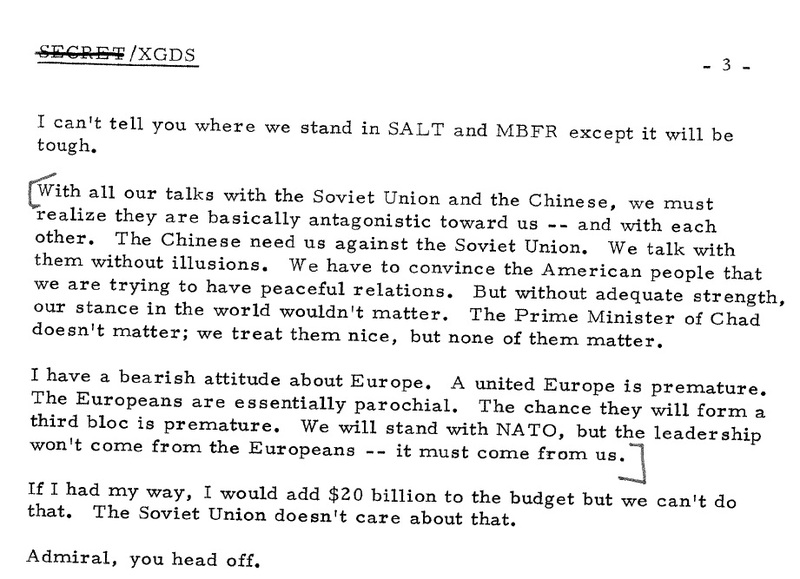 This section states that in 1973 the Soviet Union and the Chinese were “basically antagonistic toward us,” hardly a secret in need of withholding. These statements had also been classified before the successful appeal. Much of what had been excised was unsurprising or innocuous—the Soviets and Chinese are “antagonistic toward us,” Chinese and Soviet leaders “come from the soil”—so it is puzzling why the initial reviewer concluded that releasing Nixon’s statements could damage U.S. relations with another government, one of the executive order criteria for withholding information. (By contrast, a racist statement about Afro-Americans was left alone because it was not subject to the executive order). But even if this document had been declassified 10 or 20 years ago it could not have done any harm to U.S. foreign relations. There was nothing secret that truly needed protection. NARA did the right thing by declassifying this document, but the initial review needs further scrutiny. Apparently the reviewer was not aware that the declassified record including the State Department’s Foreign Relations of the United States series, is littered with candid statements by Richard Nixon (for example, the various derogatory references to Indira Gandhi in http://static.history.state.gov/frus/frus1969-76v11/pdf/frus1969-76v11.pdf/. While declassification reviewers cannot know everything that has been declassified, if they are working with high-level documents from a particular period they should know something about the declassified record from those years. In this way, reviewers might be able to avoid mistakes that have to be appealed. Faulty decisions that have to be appealed constitute a waste of time and resources, by the National Archives and government agencies and by the requesters who take the time to prepare an appeal. It is not clear that new guidance would eliminate poor decisions and no one wants to add another layer of review. But somewhere, there is a need for a reality check to minimize such problems. Declassification reviewers, like members of any skilled occupation, need to go through continual education. I wonder if the National Archives or the agencies make it a practice to inform initial reviewers when a decision on an appeal has overturned their decisions or recommendation. Such a practice could be useful for declassification reviewers and help them make better future decisions. With public confidence in the secrecy system already low, the Archives and other agencies need to take such steps to establish a more credible system that reduces overclassification. *The brackets throughout the document are not original, and indicate which portions of the document were previously excised. The original document can be located at the Gerald R. Ford Presidential Library, National Security Adviser, Memoranda of Conversations, 1973-1977, box 3, December 22, 1973 – Nixon, Schlesinger, Joint Chiefs. I think (most) declass reviewers review and redact a document based on what they believe is classified or redact material that would cause national security harm if released. It would be helpful if there was a one stop shop that contained all the material released (maybe by topic or agency) that reviewers can search and pull released documents to compare or to help them in their judgment on release decisions. On another note, just because material has been released doesn’t necessarily mean similar information can be released as in the example in the article. But overall, informative article. You propose good suggestions.